A church run by a controversial multi-millionaire African preacher has been accused of ‘cynical exploitation’ after its British branch received £16.7 million in donations from followers who were told that God would give them riches in return. Followers are ferried in double-decker shuttle buses to the church, handed slips inviting them to make debit card payments, and are even told obeying the ministry’s teachings will make them immune from illness. Today’s Mail on Sunday revelations about the Winners’ Chapel movement have prompted the Charity Commission to review the charitable status of the church – one of the fastest-growing in the UK. 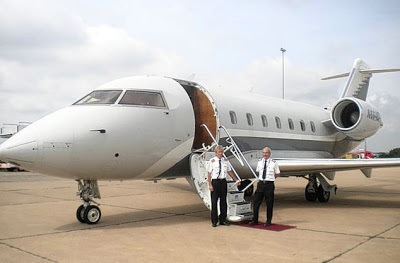 Winners’ Chapel is part of a worldwide empire of evangelical ministries run by Nigeria’s wealthiest preacher David Oyedepo, who has an estimated £93 million fortune, a fleet of private jets and a Rolls-Royce Phantom. 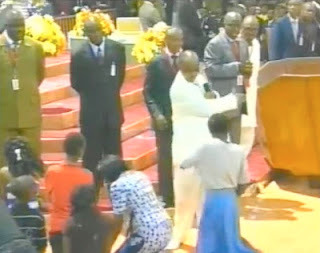 Dubbed ‘The Pastorpreneur’, he was accused earlier this year of slapping the face of a young woman he said was a witch. The assault case was struck out but is being appealed. Branches of the church have sprung up in major UK cities in a huge recruitment drive centred on Mr. Oyedepo’s ‘prosperity gospel’. This claims that congregants who make regular donations and pay tithes – a ten per cent levy on their income – will be rewarded financially by God. Followers are urged to target vulnerable people such as the lonely, the sick, the homeless and the suicidal as potential candidates for conversion. Last night, Labour MP Paul Flynn said Winners’ Chapel was cynically exploiting supporters. ‘They [Winners’ Chapel] are making clearly spurious claims and it seems to be a cynical exploitation of the gullible,’ he said. Congregants are handed a payment slip requesting payments using cheque, cash or debit card when they enter London’s Winners’ Chapel. Donations to the ministry in England almost doubled from £2.21 million to £4.37 million between 2006 and 2010. Mr. Oyedepo’s super-church in Nigeria received £794,000 or 73 per cent of the charitable donations paid out by the British Winners’ Chapel between 2007 and 2010. This was despite claims in Africa that he is enriching himself at the expense of his devotees. The registered charity has spent £6.81 million on evangelism and ‘praise, worship and fellowship’. The church’s ‘Joseph Squad’ preaches in British prisons and has a weekly broadcast named ‘Liberation Hour’ on satellite and cable TV here. In the past three years, Winners’ Chapel churches have been established in Liverpool, Birmingham, Leeds and Bradford, adding to those in London, Manchester, Dublin and Glasgow. An undercover Mail on Sunday reporter attended Sunday services at Winners’ Chapel’s ‘London HQ’ in Dartford, Kent, which attracts 1,000 congregants – chiefly African and Caribbean immigrants. 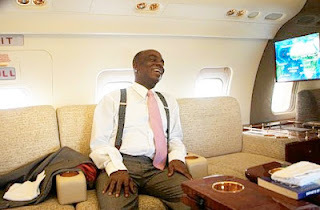 It is run like ‘a business conference’ by Mr. Oyedepo’s son; David Oyedepo Jnr. Packed buses deliver singing worshippers from South-East London, Essex and Kent to the huge auditorium. Congregants were told to fill in their slips and hold them above their heads while the donations were blessed. The service was interspersed with testimonies. ‘I received a bill from the bank that I didn’t understand, so I prayed,’ said one congregant. ‘A few days later, the bank wrote to apologize for their mistake – Hallelujah!’ ‘Hallelujah,’ the audience shouted back. Congregants were told they could gain favour by persuading others to follow Mr. Oyedepo’s teachings. His son said: ‘Look around you. Someone is sick and already wishing he or she were dead, that is a fruit ripe to harvest. Someone is confounded and considering suicide as an option, that is another fruit that is ripe to harvest. ‘Someone else is lonely and wondering if there is any future for him, that is another fruit ripe to harvest. The reporter was taken, with 20 other new recruits, to a room where preachers gave sermons claiming acceptance of the Lord would prevent them ever being ill or suffering misfortune. In May, he was sued for £800,000 over the alleged assault. The case was struck out – a decision which is now reported to have been appealed. The Winners’ Chapel movement, also known as the Living Faith Church, has hundreds of churches in Nigeria and across Africa, the Middle East, the UK and the US. Mr. Oyedepo has received fierce criticism in Africa. One Nigerian journalist accused him of ‘leading a growing list of pastorpreneurs – church founders exploiting the passion and emotion that Christianity commands to feather their nests’. Among Mr Oyedepo’s fleet of aircraft are said to be a Gulfstream 1 and Gulfstream 4 private jets. It is also claimed he and his wife, Faith, travel in expensive Jeeps flanked by convoys of siren-blaring vehicles. He is the senior pastor of Faith Tabernacle; a 50,000-seat auditorium in Lagos reputed to be the largest church in the world, and runs a publishing company that distributes books carrying his message across the world. His other business interests span manufacturing, petrol stations, bakeries, water purification factories, recruitment, a university, restaurants, supermarkets and real estate. The latest addition is a commercial airline named Dominion Airlines. Winners’ Chapel administrator Tunde Disu declined to comment. NB: I guess there is probably nothing that The Mail newspaper unearthed in the Winners’ Chapel in the UK that does not happen on a larger scale in Ghana......Of tin gods, holy dictators and anointed tyrants.